Here's an interesting proposition as Jeroen Minnema at Ocean Independence tells me he's listed a Riva's 26.02m motor yacht Volero for sale along with her matching chase boat, the 9.52m Volero II. Volero is a Riva Opera built to RINA class in 2004, refitted in 2011 and constantly maintained. She was originally MCA compliant until her owner decided to use her strictly privately, but she could easily be put back into commercial use. Accommodating eight guests in four staterooms, Volero has twin 2029hp MTU engines giving a cruising speed of 25 knots and a maximum speed of 33 knots. 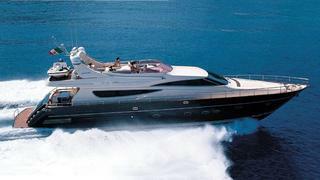 Her chase boat, a 9.52m Sessa S32 (S as in sporty and stylish) was built in 2006 and has the same Awlgrip blue paint job. Volero is asking €2.45 million and Volero II is priced at €110,000 and both are offered as a package at €2.55 million.